Ronga is a Bantu language spoken primarily in the far south of Mozambique, but also in adjacent South Afica. It is spoken by over 700,000 people and is very similar to the much more widely spoken Tsonga language. The Ronga people were evangelized by Anglican missionaries primarily through Ronga men who came from Mozambique to work in South Africa. The text given here was published by the SPCK in 1920, and contains most, but not all of the 1662 Book of Common Prayer. It is listed in David Griffiths' Bibliography of the Book of Common Prayer as 141:1. 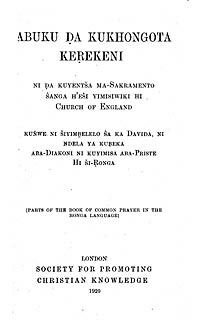 Since there are no prayers in this book for the king or the royal family, one can assume that it was intended to be used in Mozambique in the Diocese of Limpopo. This book was replaced by a newer BCP in 1988. The Ronga alphabet as used in this book is basically Latin but additionally contains a number of unusual diacritical marks. These include d, r, and t with a dot under, n with a dot over, and b with a dash under. These are part of the Unicode Latin Extended Additional page, and the only commonly available fonts which include these characters are Arial Unicode MS (for Windows) and Helvetica (for the Mac); accordingly, these are the fonts used in this work. If you see boxes where there should be letters in the Table of Contents below, you either do not have either of these fonts enabled (they are part of the standard Windows & Mac distributions), or you are using an older or less capable browser; the pages have been tested using current versions of Internet Explorer and Firefox. We also have the entire book as PDF images. There is text "behind" the images, but this has not been corrected And undoubtedly contains many errors. Ronga as currently written omits most of these diacritical marks, and presumably the text if written today would be spelled rather differently than is presented here. 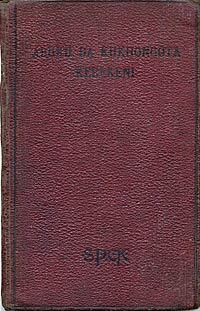 11. aŠiyimiselo ša kuyentša Nkhubu. 13. aŠiyimiselo ša kuyentšela bababyi aŠilalelo. Read or download the entire book as PDF (21MB).